Based on everything that happened to the Virgin Islands, is it the right place to base our charter yacht this year? That was the question that we needed to answer, and we didn’t have much time. What better way to discover the answer than to make a personal investigation, so off we flew. First a bit of history, I have been traveling to the Virgin Islands for about 40 years the last 37 with my wife. Most certainly not every year but more trips than I can recall. 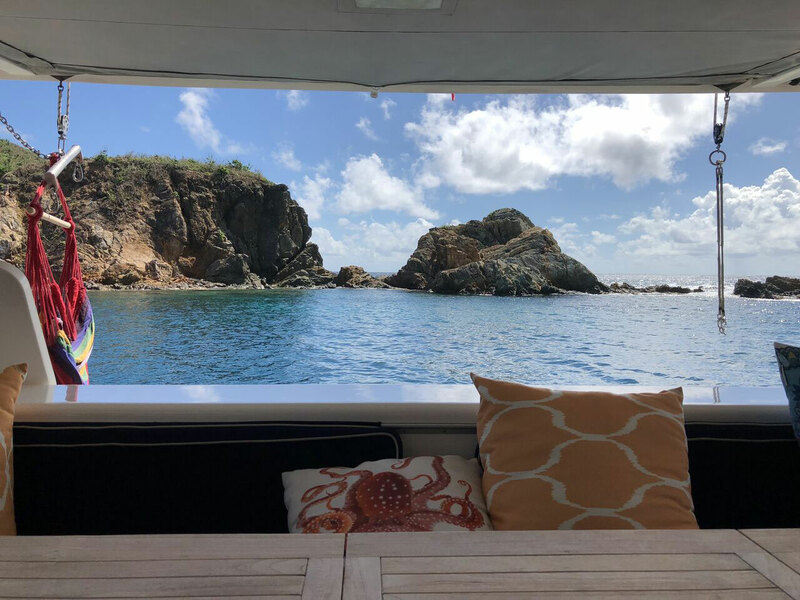 We love the area so much that 2 years ago my wife and I took the “big step” and purchased the crewed sailing catamaran “Zingara” and placed her into the BVI charter fleet. We were fortunate that Zingara was “down Island” when the devastation, in the form of Irma and Maria, came rolling through and our crew and yacht were safely tucked away in and near the Grenadines. Then the big decision – where to place the yacht for this year’s charter season?In order to gain insight,trips were planned to go check out the various areas. It’s a tough job but someone needed to do it – why not me? The first stop was Grenada and the Grenadines with my wife and her family. The islands were beautiful, tranquil, a nice distance between islands with the winds almost always coming the right direction. Each Island also turned out to have great secluded anchorages. A real possibility for this charter year. This led us to yet another question, “are those that charter willing to make the extra flight, spend the additional costs and time to get here”? Enjoying the tranquil British Virgin Islands aboard Zingara. That trip was followed by a “boy’s trip”. Nine close friends setting off to explore and answer the question” Are the Virgin Islands ready for visitors”. This question however involved a detailed look. We arrived in St Thomas on November 10 and caught a private ferry supplied by Dolphin Water Taxi from Red Hook over to Road Town. That was the only place we could clear in for the BVI’s and we had to make it by 17:00 – so speed of the ferry was our friend as we cut through the deep blue waters moving among the islands. Passing our normal entry of West End, zooming by Nanny Cay (where our yacht was docked for the Broker Yacht Show) on to Road Town. When we arrived in Road Town, we noted that customs and immigration were operating from a tent (and of course “no pictures please”). We were met by some of the friendliest immigration agents I have ever been around. It is well understood by the “belongers” (what the BVI residents call themselves) that tourism forms a major part of their revenue. The agents were jovial and excited to start to get back to business as usual. The BVI’s had only opened for tourists two days prior to our arrival.Because not everything is back to normal the process took longer, but the smiles and welcoming attitudes made the extra time fly by. Then we were greeted for the land-based taxi ride to the yacht docked at Nanny Cay. It was the first time we heard “you are my first customers since the hurricanes”from a proud and welcoming taxi driver, a phrase that would be repeated often. We witnessed the fury left behind but also noted that the islands were very green. Not the dark green that comes from years of growth and what you would remember from years past, but rather that new spring green as if is sprouting back after a long winter’s nap. A vibrant green as new life follows the natural cycle of the earth. Along the way we noted boats that were on-land skewed in unnatural positions, blue tarpaulins covered many roofs, but as the sunset you could see the lights and hear the hustle & bustle of people, while somewhat subdued, was obvious that normal life is slowly making it’s way back. Upon arrival at the marina we were greeted by the last of the boat show attendees. All were beaming with enthusiasm about the opportunity and the ensuing season and all were anxious to see “guests” already arriving. I believe we were the first, at least that’s the way they made us feel. We boarded,spent the evening at the dock then headed off to our first anchorage. First stop Norman Island and “The Bight”. Willie T’s did not fare well as the once floating establishment was now surrounded by sand resting on shore. We saw two other sailboats in route but had the place virtually to ourselves. Diving was as normal, marine life roamed as if nothing had happened and water was as clear as ever and the tranquility was reminiscent of decades past. Next stop was Jost van Dyke at White Bay. Soggy Dollar was not open, but we have heard that has since been remedied. The beaches are being cleared and it is my belief that by Christmas it will once again be one of those “go to places”. That night we headed to “Corona Island” officially known as Sandy Spit. Vegetation was gone as was the beloved tree where the small spit of land derived it’s nickname. New trees had been planted and the island still offered protection from the on-coming normal surge. It was a bit unusual to see the surf hitting the sandy shore across the spit and yet we were totally protected and hardly moved. The lack of vegetation made for great kite flying. Like they say, if your served lemons why not make lemonade. We had a great evening at anchor – again completely alone so the music was a little louder and perhaps the conversation a bit more energized and for sure the stars were more ablaze which I haven’t seen in years. Because of the lack of nightly lights you could easily see some of the more distance stars. The next day crew got us underway and off to Peter Island. A great wreck dive during the day then an incredible night dive that evening off the back of the yacht. Two boats joined us in the cove that night with plenty of room between each of us. We finished up by heading to St Thomas and cleared customs in Charlotte Amalie. Cruz Bay immigration offices on St John were not yet opened. Now is decision time – Are the Virgin Islands ready for visitors?It depends is the best answer I can give. If you’re looking for pristine hotels (some are available), looking for unique high-end restaurants (some are open and ready to serve), then perhaps it will be a great trip. I would plan early to make sure you can get a room. If, on the other hand, you are looking for uncrowded white beaches and anchorages, the traditional beautiful clear and warm waters and enjoying them aboard a chartered yacht or a bareboat, the answer is “the Islands are open and ready for you”. In closing, the Islands will rebound and the sooner the revenue starts flowing, which is in large part from tourists arriving back, the sooner the USVI and BVI areas will recover. Gene Trousil, along with his wife, own a chartered yacht business featuring their sailing yacht Zingara. He has sailed in numerous locations throughout the world including the USVI, BVI, Bahamas, US, Croatia, Fiji, Tahiti, Australia and Thailand. 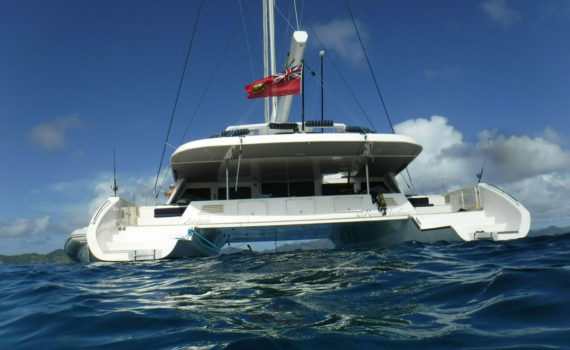 They currently operate their yacht S/Y Zingara in the BVI’s along with Captain Lee Adams.